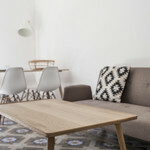 This Barcelona penthouse apartment is a luxurious apartment which can fit up to 4 persons. The penthouse has a sunny terrace with sunbeds and amazing views on the Tibidabo. The Barcelona penthouse consists of 2 comfortable bedrooms; one double room with spectacular window views and the second room with a twin bed and a door with access to the terrace. The apartment also has a fully equipped kitchen and a decent bathroom. This beautiful penthouse is situated near the Barcelona University, Passeig de Gracia and only a 10 minutes walk away from Plaza Catalunya with it's amazing Antonio Gaudí achitecture. Metro Universitat.